For the past few months I have been working with a start up company here in Lake Forest, California called We Play Loud. We Play Loud is an indoor playground for children to run wild in. I created all of the branding for this company based on a set color theme and list of characters. The Lake Forest venue has two 25′ murals for their birthday party rooms and 4 columns painted with characters. Each four sided column shows different scenes with the core characters. 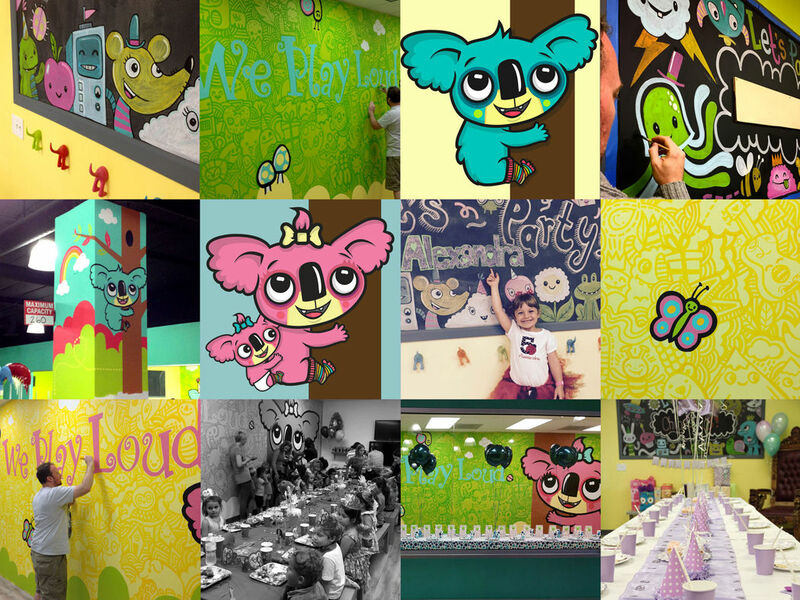 The two mural center around the main characters, two adorable koala bears. The background for each wall was hand doodled straight onto the wall. This was pretty nerve wrecking to be honest. Drawing directly onto a wall with no eraser tool so to speak means getting it right first time. I was also asked to return to create 4 chalk boards, 2 for the cafe area and one for each of the party rooms. WPL have been a pleasure to work with and the project, while exhausting was one one of my favorites to date. If you live in the Orange County area I suggest checking this place out with your kids. It’s a lot of fun.